The time is ripe for T-Mobile and Sprint to take market share away from the dominant megacarriers in the U.S. mobile market, according to UBS Telecom analyst John Hodulik. In a research note released today, Hodulik said we’re at the confluence of a several trends, from over-saturation of phone subscribers to parity in 4G networks, that could turn the tables on giants AT&T(s t) and Verizon Wireless(s vz)(s vod) and lead to a potential renaissance for the industry’s two whipping boys of recent years, T-Mobile(s tmus) and Sprint(s s). The second quarter was a turning point for T-Mobile, seeing its biggest growth spurt in four years. T-Mobile added 1.1 million new subscribers, beating out its three larger competitors, and that’s without factoring the 8.9 million subscribers it gained from merging with MetroPCS. T-Mobile also saw its churn rate – the percentage of customers that leave – decrease, while the overall industry churn remained flat. T-Mobile managed to gain share from all of the other big three, Hodulik said, and that trend only accelerated after the quarter ended and T-Mobile launched its Jump smartphone trade-in program. According to UBS’s calculations, in the final week of July T-Mobile was gaining two subscribers from AT&T and Sprint for every one it lost to those carriers. Sprint conversely had one of its most dismal quarters, shedding 2 million subscribers. But that was mainly due to the sunsetting of its Nextel iDEN network, basically leaving millions of subscribers to find a new provider. Now that the Nextel albatross finally has fallen from its neck, Sprint is now ready to compete without any handicap, helped along by SoftBank’s billions in investment dollars, Hodulik said. First, Sprint and T-Mo’s LTE rollouts are catching up to the competition, eliminating a key competitive advantage AT&T and Verizon have enjoyed for the last two years. In particular, Sprint is actually showing signs of building the mammoth 4G networks it promised years ago, which would give it enormous amounts of LTE capacity. 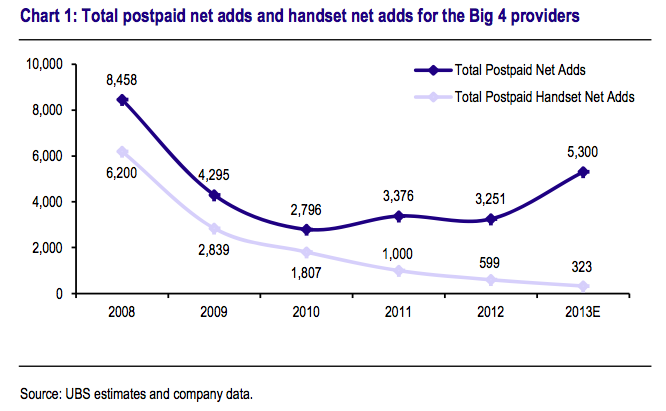 Second, postpaid phone growth is stalling. UBS is forecasting that prepaid growth will begin to accelerate once again as customers switch from postpaid to contract plans, lured by cheaper prices coupled with more attractive mobile data plans. That can only benefit Sprint and T-Mobile. Third, the competitive battle in the U.S. has become a war attrition as evidenced by Chetan Sharma Consulting’s report earlier this week. The number of overall connections in the U.S. is barely increasing so in order to grow carriers are stealing subscribers away from one another. According to Hodulik, that presents a unique advantage for Sprint and T-Mobile who have shown they can highly competitive in both pricing and promotional offers. It’s a question of whether AT&T and Verizon can match them. Hodulik is a highly respected telecom analyst, and he paints a very compelling picture of how the U.S. mobile industry could shake out in the next two years. But my gut tells me that his predictions might be a bit premature. While many of the trends Hodulik has spotted span much more than a three-month period, he’s basing much of his analysis on carriers’ performance in the second quarter. And frankly Q2 was a pretty messed up quarter for one big reason. We saw the complete and total shutdown of a nationwide mobile network in Q2 – an event we only witness once or twice in a decade. More than a million Nextel and Boost Mobile subscribers suddenly found themselves without a network to connect to as of June 30, so naturally many of them gravitated to the other carriers. Since both T-Mobile and Sprint are the lower-priced operators, many of those homeless subscribers naturally wound up at T-Mobile. It still remains to be seen whether T-Mobile’s big Q2 surprise was the beginning of its big recovery or an anomaly. Don’t get me wrong. I agree with Hodulik entirely that T-Mobile has momentum and Sprint could quickly build some. But I also want to wait a few more quarters to see if T-Mobile’s assault at the Verizon/AT&T citadel is really working. thank you sprint president dan hesse. i don;t have to read it. being there is better than reading about it. its such a shame, i give sprit 18 m before they are out of business…..
will sprint be paying a dividend in the future? and if so,when about.thank you. im getting 4g in a few places i wasnt before,TMOBILE going to the top Baby!! This is no anomaly. T-Mobile’s success has not come purely as the result of the mobile network shutdown on June 30th. This has been planned for some time, and T-Mo’s CEO, John Legere, is a very fiesty and aggressive leader, who seems to be hell-bent on sticking it to the larger carriers. He wants to drive their business by eliminating customer painpoints, believing that this is the key to driving growth. Others are weighing offers based on solely the bottom line. The larger carriers are still about contracts and ridiculously outdated business practices while T-Mobile is changing the game. Others will point to the introduction of the iPhone to T-Mobile as a reason for the growth…but this is only a fraction of the overall success. The iPhone only accounted for about 29% of T-Mobile’s growth during that time…so it obviously was NOT the driving force…just like the network shutdown was not the driving force. I really believe in what Legere is doing with T-Mobile. Eliminate contracts, simplify rate plans, give the people what they want…but don’t TELL THEM WHAT THEY WANT. If you do that long enough, they will get fed up. People are flocking to T-Mobile, more than anything else, because they are simply tired of doing business the way wireless companies have been doing since…well, quite frankly…since wireless first came to be. T-Mobile is changing the game, and the masses are reacting to it in a VERY positive way. Just watch and see how T-Mobile closes 2013! Q2 was no fluke…and Q3 and Q4 will only solidify this position. That’s all well and good JB. But looking at Sensorly.com’s 2G/3G coverage maps for overall footprint of the big 4, it looks like Verizon is 1st, Sprint 2nd, AT&T 3rd, and T-Mobile in 4th. 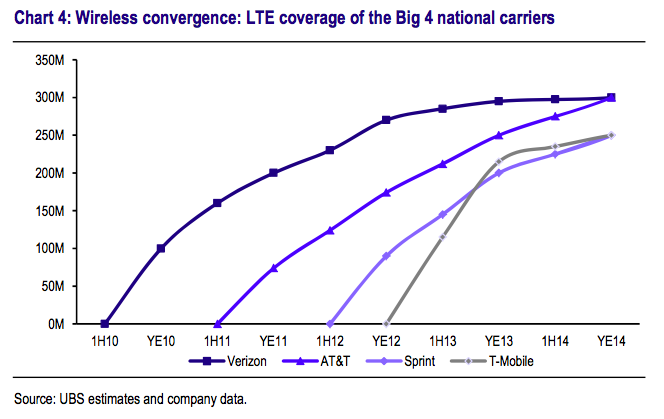 MetroPCS adds to T-Mobile, but Sprint WiMax (Clearwire) also adds to Sprint to a lesser degree. T-Mobile has had to throttle even though they been laying fiber longer than Sprint has. Probably because T-Mobile had spectrum bandwidth constraints before their users eventually switched to 3G+ and 4G devices. Sprint has been hampered by a few things trying to get network vision deployed properly (mostly not using fiber and microwave soon enough and not getting Nextel shutdown soon enough to use their 700MHz spectrum for building penetration). But with Softbank’s investment, it’s all gonna come together a lot sooner and Masayoshi Son has already been where John Legere is trying to get to. So it’s plain to see Sprint with Nextel & Clearwire assets being re-purposed and Softbank’s experience, Sprint has more capacity, more places, and I believe more vision to grow. Bingo JB! Thank you. Feisty is an under statement. John Legere is really on top of his game. Contracts are as outdated as Blackberry and the palm Pilot. Why don’t the big three have game changers like eliminating contracts and simplifying rate plans? Wait maybe because At&t did this in 2002 with the goPhone? And stop knocking Blackberry and palm already. Quite frankly these company’s pioneered ideas like mobile data and touchscreen smartphones…..